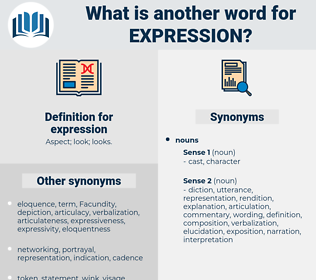 What is another word for expression? greetings, remarks, says, speech, wants, Expressing, manifestation. manifestations, exhibitions, concepts, assurances, ends, finishes, deadlines, outlets, futures. 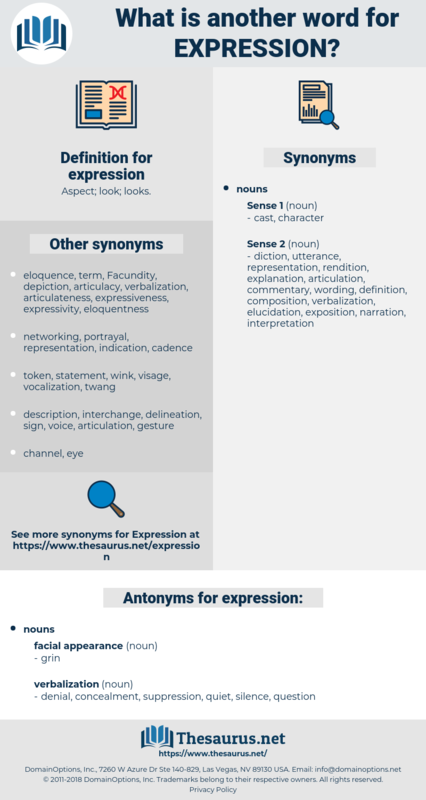 expr, opinion, speech, formulation, notion, terminology, definition, concept, representation, appellation, assertion, equation, Expressing, affirmation, illustration, manifestation, gesture, proverb, remark, realization. words, word, phrase, wording, term. word, reflection, articulation, embodiment, translation, language, phrase, saying, interpretation, discourse, performance, sentence, rhetoric, sign, demonstration, meaning, testimony, wording, protest, display, term. denial, concealment, suppression, quiet, silence, question. Garvin had looked up with an expression of surprise and then he had smiled. twinkle, spark, sparkle, light, leer. blowup, act, lamentation, mourning, outburst, Ebullition, gush, effusion.